Think there’s no such thing as a Canadian heritage name? Thanks to Christina for suggesting one that might just live up to that description. Today’s Name of the Day is Lorne. While some names conjure up Pilgrims or the Wild West, few are quintessentially American. Ditto Canadian appellations. While some bring to mind famous citizens or places on the map, only a handful are exclusive to the country. Lorne is the exception. 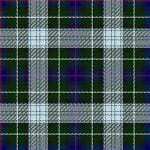 He comes a Scottish place name, possibly derived from Loarn mac Eirc, a 5th century ruler. There’s a Marquess of Lorne, too – it is the title customarily given to the Duke of Argyll’s firstborn son and heir. In 1878, he was appointed Governor General of Canada. Much excitement surrounded the arrival of the Marquess and his royal Marchioness. But Lorne caught on as a boy’s name, presumably given in honor of the Marquess. 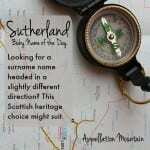 And yet the name may have been in occasional use earlier. In the 1900 Summer Olympics, Lorne Currie brought home a gold medal for England. He was born in 1871. 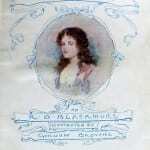 There’s also Lorna, the feminine equivalent, created by RD Blackmore for his 1869 novel, Lorna Doone. The Marquess’ rule in Canada clearly inspired the name’s use from sea to sea. Along with politicians and hockey players, the most famous Lornes are probably Saturday Night Live creator Lorne Michaels and actor Lorne Greene. Greene was actually born Lyon Greene, the son of Russian immigrants. He started out on CBC radio, but is best known as patriarch Ben Cartwright on television’s Bonanza. The family’s adventures on the Ponderosa ran from 1959 through 1973. Bonanza’s broadcast boosted Lorne in the US. The name debuted in the rankings in 1961, peaked at #561 in 1966 and disappeared after 1972. While Lorne Greene’s career continued – he played Commander Adama on Battlestar Galactica and served as a pitchman for Alpo – the name has been headed towards obscurity ever since. That’s true in Canada as well as the US. Lorne did attract some notice in the early 2000s, when television’s vampire-detective series Angel added a character wearing the name. Unfortunately, he was a green-skinned, red-horned demon using Lorne as a nickname for Krevlornswath. Little wonder it didn’t catch on. Overall, Lorne is gentle but with a bit of cowboy charm. While he might’ve sounded strangely out of place on the same playground as Jason, Kevin and Brian, the rise of single-syllable, Western-inspired appellations like Cade and Beau might open the door for Lorne again. And, of course, if you’re Canadian, this is as natural a fit as maple leaves and Don Cherry. I like Lorne, although I don’t know if I’d ever actually use it. The super-popular Canadian TV show Corner Gas (currently in its final season) stars a Lorne Cardinal. I could like Lorne! I actually really like Loren on a boy. (I met a 20-year-old furniture salesman named Loren a couple weeks ago.) Lorne seems even less feminine — I don’t think it would be confused with Lauren at all. I know (of) a Scottish Lorna about my age (mid- to late-twenties). Though we never met, I’ve heard a lot about her — she’s the ex-girlfriend of one of my good friends from England. The name doesn’t seem particularly dated to me, but it doesn’t really appeal. I think I’ll take you up on your reading suggestion, Lola. Lorna Doone is one I feel like I should read, but as I don’t hear it mentioned much, it hasn’t been at the forefront of my mind. Next time I’m in a bookstore, I’ll have to look for a copy. Ah! I didn’t check this yesterday! Lorne – simple and underappreciated. As a regular TV viewer I associate it with both Bonanza and SNL. Thanks for the Scottish connection and the Canadian history, eh? Vaughn I get (its my uncles name) but Lourne?!? I have to say I prefer names that ytou don’t have to mow once every 3 weeks. I know it won’t fly in our house, but I would delighted beyond belief to meet or hear of a wee Lorne. What I do find funny is that Lorna strikes me a bit too country bumpkin, though I like that name too, but Lorne is dashing and handsome. It’s funny we were just talking about Lorne Michaels yesterday! He seems to mamge to be somewhere every episode, and I think it’s net, sicne it’s his baby, that show. Why shouldn’t he? I kind of like Lorne, he’s breezy and comfortable and that makes me like him. I used to have an 1880 copy of Lorna Doone by Blackwell. It had a blue cardboard cover with touches of gold leaf on it andthe pages were gold edged too. I lost it during the move (I think the movers stole a box of books). 🙁 I miss it. Bought it for a quarter from some old guy as a flea market when I was 10. He must’ve thought I was nuts but I still got it. Great story, too. I suggest it a lot when others are looking for a good read. So even the feminine version appeals to me. But if I had to choose, I’d go with Lorne. It just appeals that little bit more. And hey, I could say it’s for me! 😀 Lorne’s cool, gets a solid :thumbsup: from me! […] there were some fabulous finds, too.